3. Mitsubishi Rayon Co., Ltd.
8. Sakase Adtech Co., Ltd. 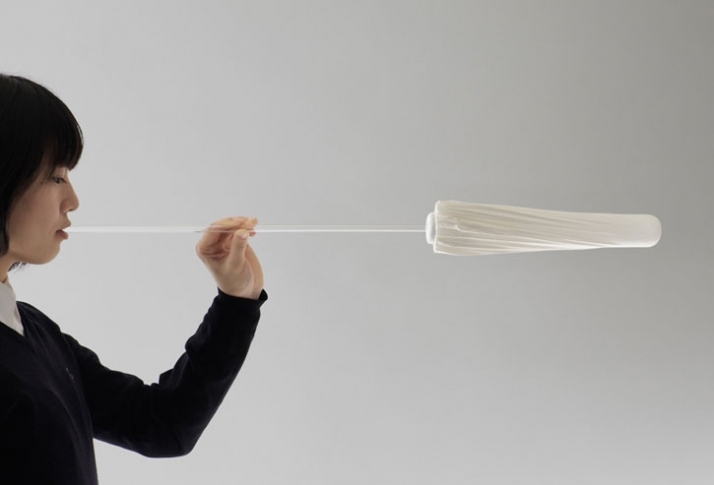 The idea for this product came from the microfiber's air-tightness. Having the fibers so densely packed in the fabric, results in unique and mysterious movements. Combing that property with an everyday item and presenting it in an ordinary environment reveals what's interesting about this material. “Theatre products” is a fashion brand, but its underlying idea is to bring theatre into everyday life. Usually this creation of theatre-in the sense of time and space replete with happiness-is done using apparel, but for this exhibition we have created a coffee table and tablecloth. 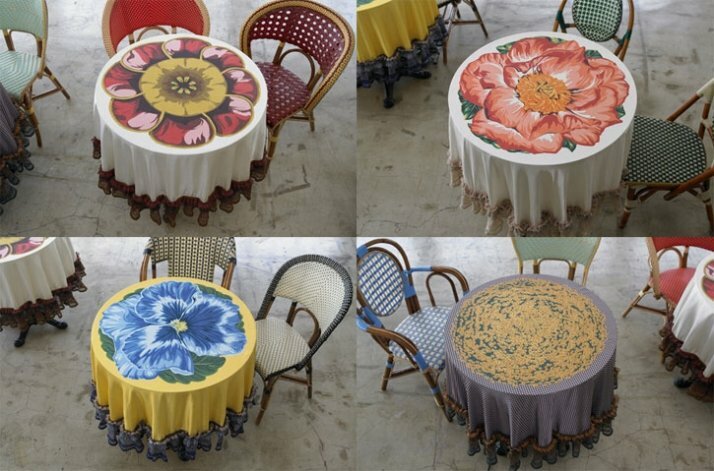 The print on the tablecloths are a development the flower motifs we always use on handkerchiefs, representing Japan's seasons-primrose, pansy, wild chrysanthemum and peony. 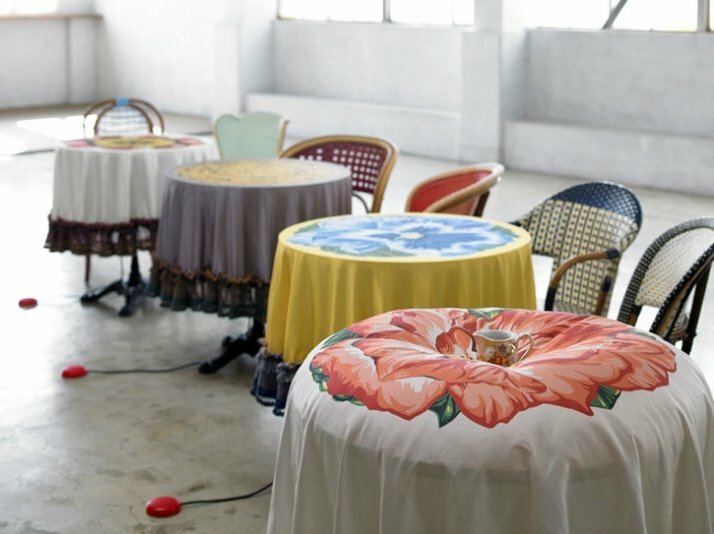 The tables were set up so that viewers could experiment with blowing wind into the tablecloth, and enjoying the surprises. Ordinary lanterns are made by winding this strips of bamboo onto a wooden frame, linking them with thread to provide vertical reinforcement and then gluing Japanese washi paper onto the outside. 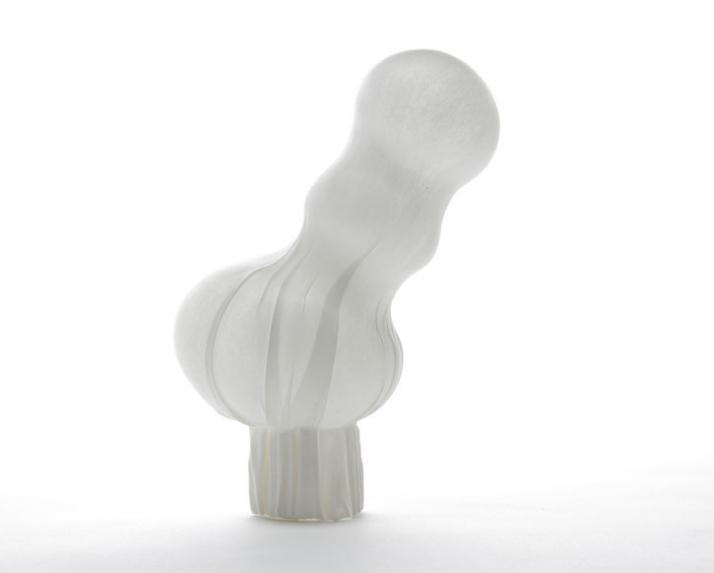 With SMASH®, however, we attempted to form the shape by a glassblowing-style process, heating up the material and then blowing air into it to inflate it. This enabled us to produce a seamless one piece lantern. 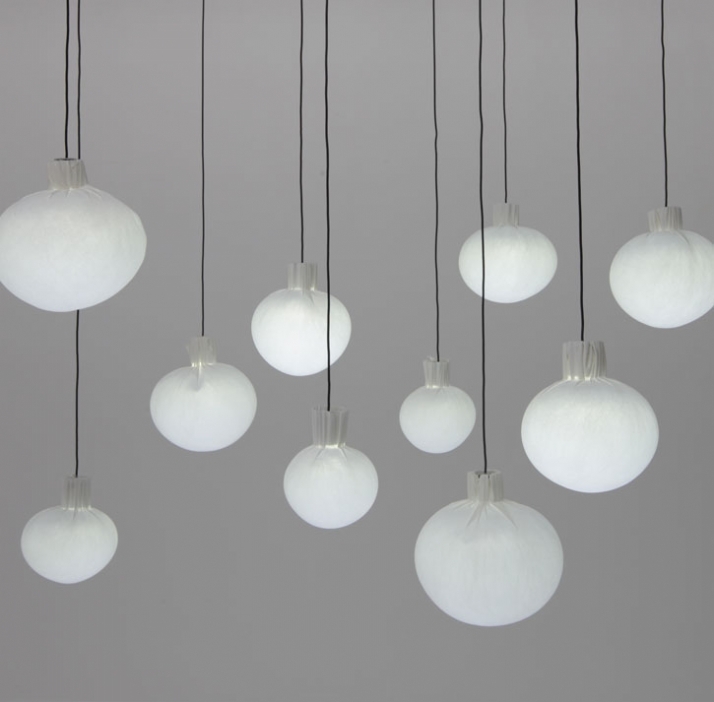 The blowing process cannot be fully controlled, so differences in air pressure produce distortions in the product, which results in each lantern looking slightly different. 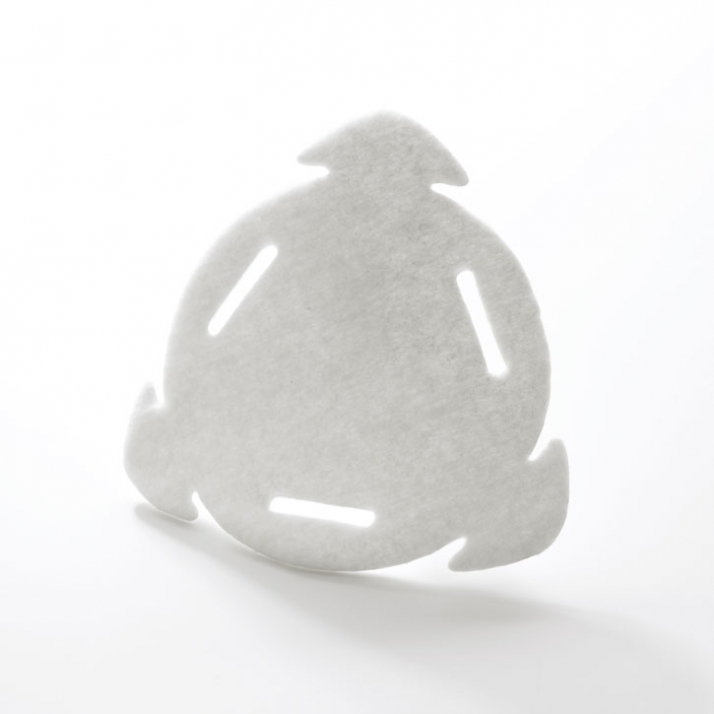 Another feature of the blowing process is that the shape is formed little by little, making it possible to create a large variety of different shapes, almost like viruses or bacteria. This sort of diversity is almost impossible to achieve with moulds and dies. The structure of the lantern is very simple, and involves only attaching a light source to the neck. However, since the material is likely to deform if the internal temperature reaches 80C, we used low-heat LED lamps, with machined aluminium sockets that also acted as heat sinks and radiators. FELIBENDY™ has air-permeability, water absorbability, acoustic absorbability, stretch-ability and other properties, and is a non-woven highly functional fabric with the capability of tuning its comfort to the human body. Created using a steam jet manufacturing process, the material is extremely lightweight and has superior three-dimensional formability. Here, softness and hardness are manifest simultaneously in one material. 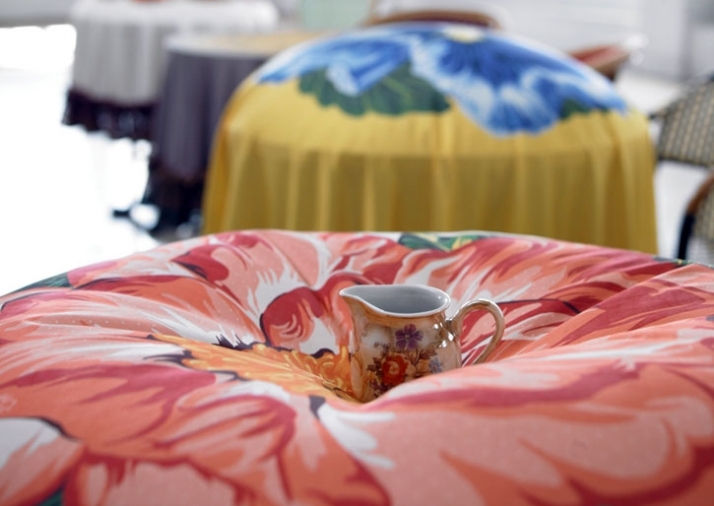 I was introduced to FELIBENDY as a fluffy cloud-like material that could be processed into blanket-like fabric tuned to a variety of different thicknesses and hardness’s. That encounter inspires two stories. First was a shape like a cradle, with a depression in the center where a new-born baby could be placed. Around it, I envisaged ivy-like relieves to signify celebration of the child's birth. The extra fabric on the outside can be used to cover the baby, or it perhaps used to rock the cradle. 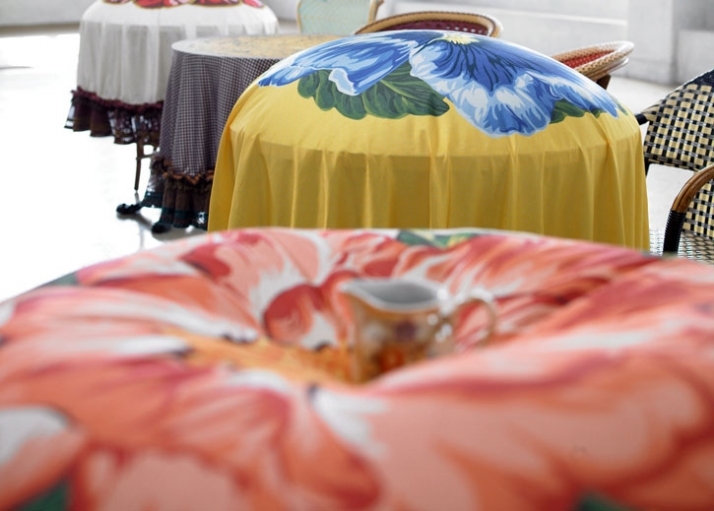 The second idea was of a round piece of fabric that could be linked as desired. 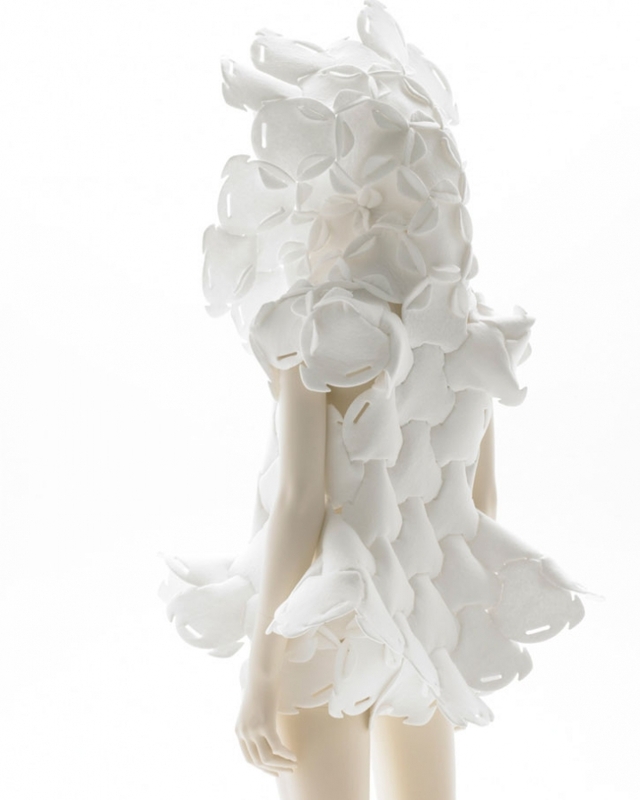 I used the pieces to create clothing in the image of a mother. 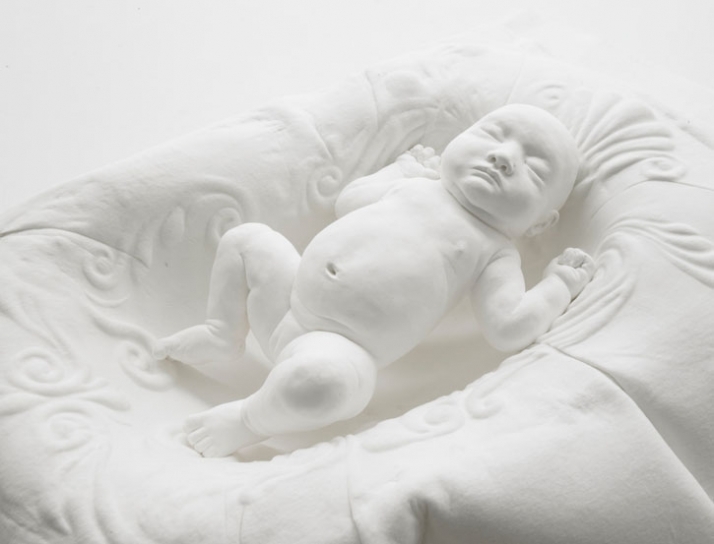 Some of the same pieces can be joined together to make a cocoon cradle-a metaphor for the way that DNA provides a link from the past to the future. 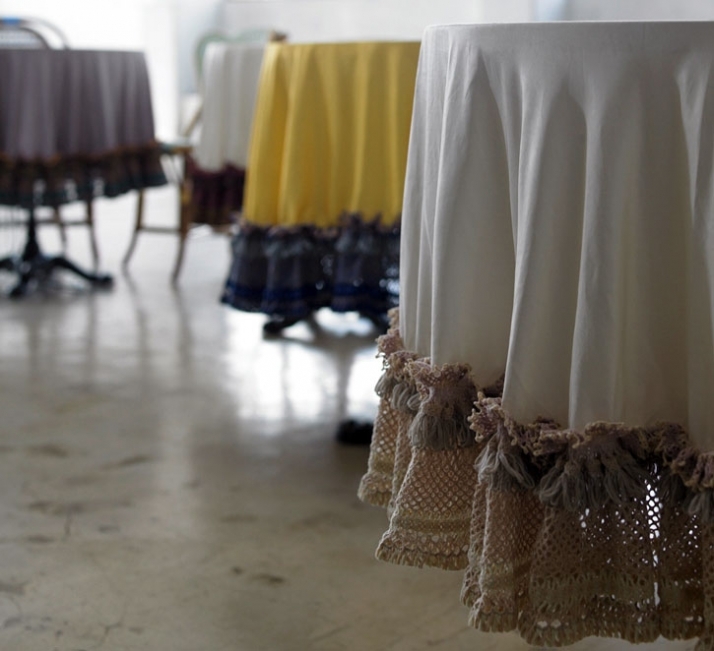 Hot steam enables the material to be freely formed, but when it sets, it firmly retains its shape. 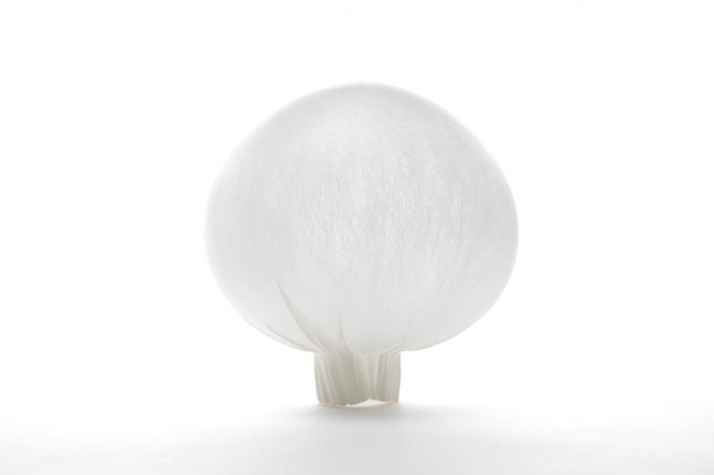 This property allows softness and firmness to co-exist in the same sheet of material. FINEX® is a specialized stretch material having a double or triple-layered structure, which uses the polyurethane elastic fiber ROICA® in joints. It is light, soft with high permeability and may be used to create reversible or three-dimensional structures. The stable shape prevents fraying and curling of the fabric edges and is suitable for moulding. 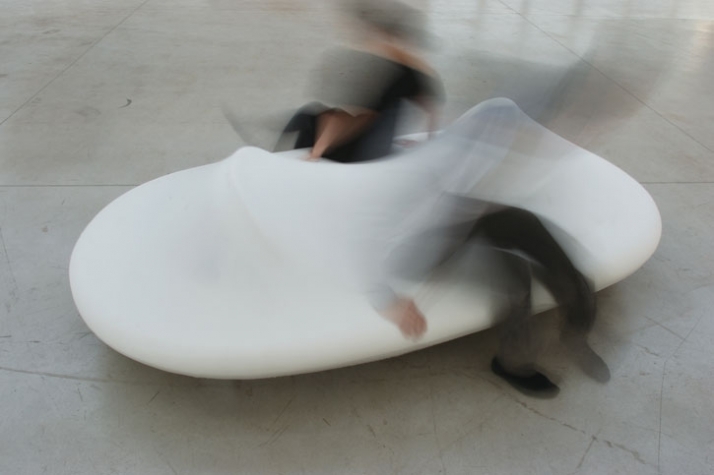 Moshi -Moshi is a sofa covered using FINEX® to suggest new ways of sitting. 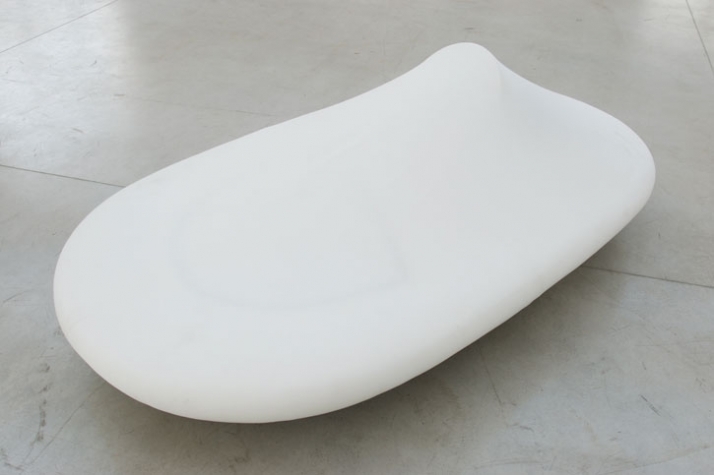 It starts out as a simple oval, but the sofa incorporates mechanisms that can raise supports to change its shape. The idea works so well because it is able to make use of the maximum elasticity that is a characteristic FINEX®. Raise the two backrests at the same time and two people can sit face to face. Like an electric massage chair, electric movement is smoothly integrated to provide a comfortable piece of furniture.